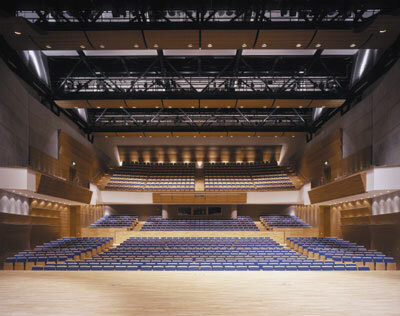 Many contemporary arts buildings look like icons chasing a purpose but two new concert halls, Perth Concert Hall and Glasgow City Halls, have been driven by a strong programme and a desire to create great acoustics. Prospect talked to the architects and the acoustic engineers involved in the projects. Bruce Kennedy is as interested in music as he is in architecture. As a student his final thesis involved research into concert halls, and also included the design of a small hall. He looked at St Andrew’s Hall, now demolished, and City Halls in Glasgow as part of his study. So working on Perth Concert Hall has been a labour of love, even if it has been a protracted affair. 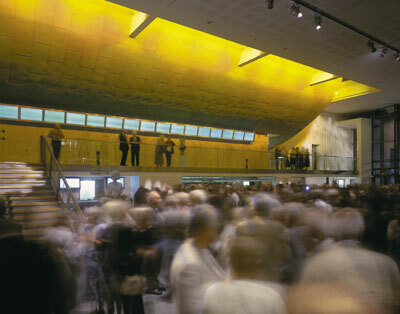 BDP won an RIAS competition for the building in 1998 and the £12.3 million project was completed at the end of 2005. The client (Perth and Kinross’s property and economic development department and its arm’s-length leisure services company) was looking for a stand-alone building with a distinct identity that could operate as a performance space, double up as a conference venue and form part of the regeneration of an area. The project has gone through some brief changes and funding difficulties but thanks in particular to a local trust the finished building has a high-quality concert hall for over 1,000 people. Kennedy worked closely with Douglas Templeton, one of BDP’s acoustic engineers, to produce an auditorium that was good enough for recording. “It was important to get the volume right. We were aiming for ten cubic metres per seat, which gives the right volume for an orchestra. We modelled the acoustics using an Odeon programme; you could listen to the sound quality for any seat in the house,” says Kennedy. 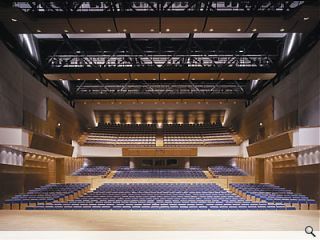 The shape of the auditorium is halfway between a fan and a shoebox and has a shallow balcony. “With the fan shape you get better proximity, but it is not so good for direct sound. With the shoebox you pay the price for being further away, which was a real issue in Georgian times, but is less important now. Today’s instruments tend to blend sounds and produce more volume,” he explains. Most of the hall interior is in situ concrete. “The concrete is acoustically dense and reflects sound and it has a monumental quality,” says Kennedy. The back of the stage is clad in Swiss acoustic timber panels, finished with an American cherry veneer. This polished warm layer is a reference to the inside of a musical instrument. The structure has been designed to protect the auditorium from incoming noise and the services can be operated at a very low level to allow for recordings. 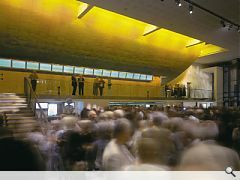 Kennedy was keen that the auditorium felt like a room rather than a black box. “It is important for concert-goers to look around and see other people, not to feel like they are in a cinema,” he adds.